Dalmatian JASPER for grounding the base chakra. Please read below to learn more about the metaphysical properties of these beautiful stones. 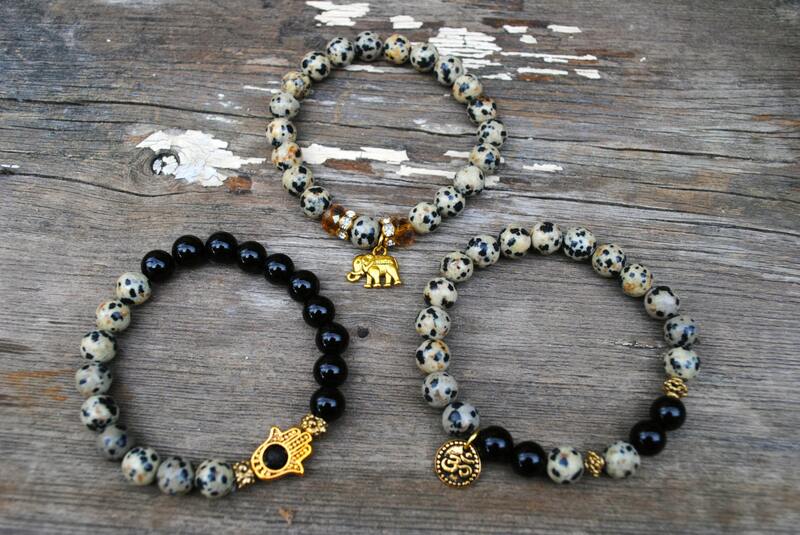 Δ Bracelets feature a gold tone OM, Hand of HAMSA, and Elephant charm. 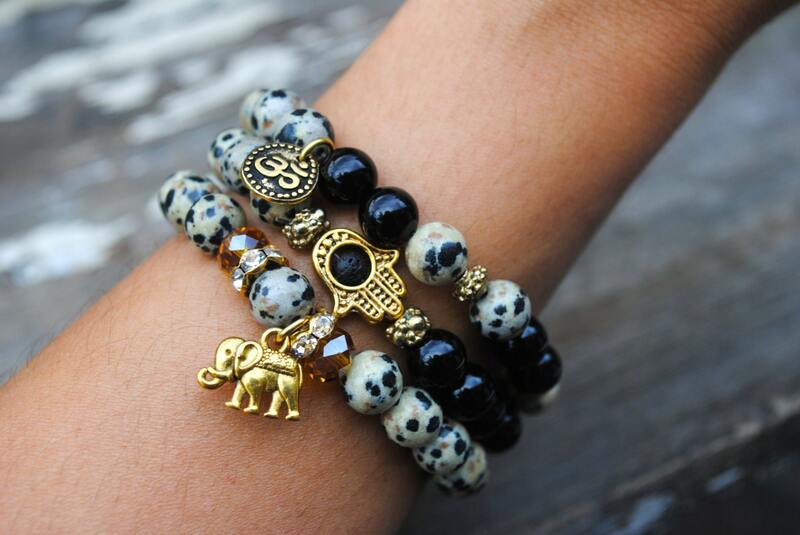 Δ Stretchy bracelet. Please send me your wrist measurement in inches to ensure the right fit; otherwise, I will send you a 6.5 to 7 inch (i.e. average size wrist) bracelet. BLACK ONYX - Onyx gives strength. It promotes vigor, steadfastness and stamina. Imparts self-confidence, helping you to be at ease in your surroundings. Onyx banishes grief, enhances self-control and stimulates the power of wise decision-making. It encourages happiness and good fortune. Onyx treats disorders of the bones, bone marrow and blood. 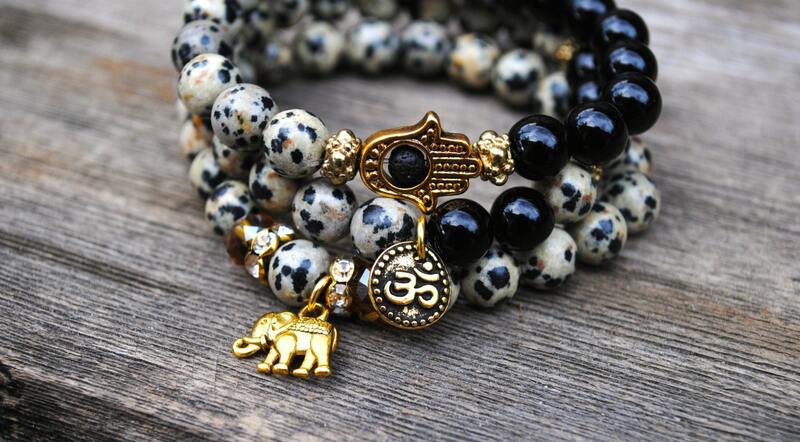 Black Onyx is associated with our Base Chakra and is beneficial in balancing this chakra. Dalmatian Jasper, also known as "Dalmatian Stone", is a grounding stone. It removes disillusionment, helping one to see their strengths and weaknesses more clearly. 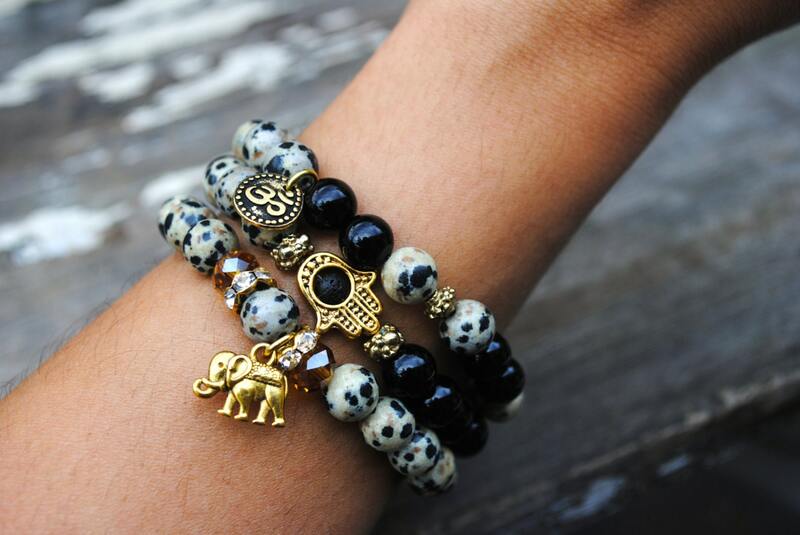 Dalmatian Jasper brings a sense of fun to one's life and helps to increase loyalty in relationships. It purifies the blood and boosts the immune system.